Welcome to Storied Mind. I’m John Folk-Williams, the site’s writer and jack-of-all-trades. My motive in setting up this website is to share with you the ideas, stories and information that have helped me get free of depression and restart my life. There are many good websites offering the guidance and expertise of professional mental health providers, and several are listed in the Information Websites section. The concern here is different. It’s about the experience of people like you and me who know what depression is like because we’ve lived with it for years. We need to learn what we can do on our own and how we can support each other. How can we use professional guidance to get better? What do we do if the treatments don’t work? How can we help ourselves to become vital human beings again? What can we learn from each other? What can we hope for? You and I need answers to those questions – and a hundred others. I believe a lot of healing takes place when people who have lived with depression tell their stories to each other. Those stories are what this site is all about. I hope you’ll get involved by adding your ideas, by suggesting helpful resources and by sharing your own experience. Since the site is intended to be a helpful resource, I hope you’ll let me know how it can be improved to meet your needs most effectively. You can find a short version of my recovery story here. If you want to read more of my posts, you can check out the ones I’ve written for Health Central. More recently, I’ve started contributing to MentalHelp.Net. PLEASE NOTE: This site does not offer medical or therapeutic advice or step by step methods claiming to cure. The purpose is not to make suggestions to you about your treatment – that is between you and the professionals you consult. All the original writing and images are copyright protected and cannot be used without explicit permission, except for fair use of brief excerpts with links back to this site. Hi, deep in my 80’s. Going through another tussle with the Black Dog. I don’t know if I can lick it this time. Obstacles seem mountain high. Absolutely convinced that one of the ways to chase the Black Dog is to reach out to a community of people who know just what you’re going through. Courage everybody., The journey of a thousand miles starts with the first step. 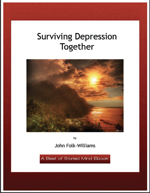 I purchased your ebook which is full of insightful stories and ideas for recovery. I guess I’ve come to a point in my struggle where I’m extremely overwhelmed at my life circumstances and understand the vicious circle I’m in yet the increased inability to think clearly and brain fog is becoming intolerable. Not able to work due to severe anxiety and severe depression increased physical issues, pressure of brother to leave his home because he believes pushing through divorce will help me recover. What he doesn’t understAnd or appreciate is that I’m experiencing serious problems concentrating and focusing and decision making and find myself in deep despair. I don’t know how to best proceed to seek help?? Having serious cognitive challenges and physical problems with GI issues, headaches, dizziness etc. Been on 7 different antidepressants during last 8 years and did not get much relief and now battle chronic insomnia which exaserbates the worsening symptoms. Talk therapy is not helping me much and not able to see a future is so demoralizing. Therapist simply says list out my to to do’s and prioritize them and do them one at a time. The problem is the severity of what I’m facing and needing to get done which affects engaging divorce, selling my home, uprooting adults kids living at home when I struggling to get out of bed literally. Writing this is a real challenge. I realize I have to help myself but my body and brain and not helping me function and do what I need to do??? Feeling so shameful of this existence and simply wa t to be able to sleep feel rested enough to gain some clarity/hope. Sorry, you are the few people who can relate to what and where I am mentally/physically and seek direction. I’m a 38yr male. Im really mentally tired. It seems like men need to be strong. It seems, as males, we aren’t allowed to admit we are depressed and tired of life. There just seems like there is no one to talk too that would understand. I hope you’ve been well. Life can be hard, it’s not easy. Males hold this figure of strength, but you know what, it is OKAY to not always be strong. Nobody can be strong and keep it together 100% of the time, they would be lying if they said so. On that note, let your emotions come through. Cry if you want, hell who cares, no ones judging you, I’m not. Hope I lifted your spirits somehow. Bye for now. I’m just coming out of one of the most painful episodes of depression that I’ve had in a long time and I was googling “should I go to work depressed,” in an attempt to get feedback on whether I should push myself one more time and just “fall in” as my mother used to say. I came across your blog and read the shortened version of your story. It had never dawned on me that working 39 years as a nurse in intensive care units was helping to keep me struggling with bouts of depression. I read more and began to come out of denial of how depression had affected my whole life. From being holed up in my bedroom listening to Billie Holiday as a teen, to years of living with shame and feelings of unworthiness, to giving up my dreams of acting and writing, living alone for so many years and feeling unfit for a loving relationship to finally finding myself at 62 wondering what kind of future lay before me. I’ve done years of self help, 12 step recovery, relocating to different places and God knows what but I never blamed my depression as being the reason for why my life was the way it has been. I went from studying depression, to being on numerous meds and natural supplements to eventually pretending it wasn’t there. Until I got hit with another bout that is. Intellectually I know it’s an illness of my mind but emotionally I feel like a failure. My family and friends respond with helplessness and even anger at times. Something about your story gave me hope and a willingness to finally give myself the care and attention that I have needed for so long. The hope that maybe I can make changes in my life and find healing and a life of fulfillment. I just purchased Storied Mind (thank you for your generous price) and I’m going to start reading it tonight. I’ve been helping others to heal for 39 years. Maybe it’s time I walk away from the stress of ICU and start to heal myself. I’ll start by giving myself a few more days to get better. Thank you for sharing your story. Thank you for sharing your journey. I just bought the e-Book. This information is so valuable to me. I can’t talk about it with anyone I know. And I can only see my therapist once a week. So the rest, I’m on my own floating in a sea of uncertainty with no sight of shore anywhere. This gives me hope of finding some much needed answers. Thank you!!! I couldn’t find an appropriate thread to post. I’m so tired of pretending to be okay. I have the most extraordinary partner. The sort of Prince Charming little girls pray for. I love him. Yet I spend most of my time telling him how annoying he is. I ask him to shut up. He responds by kissing me and laughing because i can be sarcastic, but I know he knows when i’m being [unintentionally?] intentionally mean for absolutely no reason. I know it hurts him. Where is the line between ending things because you believe that you’re hurting someone and believing that you have a partner who knows and accepts what they’re”in for”? Which one of you makes that call? I just happened to find your site here by accident… I’ve lived long enough, to know that everything happens in life for a reason. In dealing with my own depression for decades, that seriously got me started, reading the Bible. I had lost my job, had had a bad back injury, I was asking God for help. Eventually I got well enough to return to work for until I could no longer work because of depression. Ten years would go by. On one of my bad day’s these three words that kept showing up in my thoughts…..’believe, ‘trust, and faith. Following this higher awareness, I started believing His word, I found that I could trust Him, and that He was faithful, so that I could have ‘faith’ as small as a mustard seed.. Ten years later, I know He leads me, I’ve come to develop a life of learning, that is my passion. I’m also looking for ways to share what I’ve learned from life, and other higher learning courses. I believe, that finding your website, is His way of showing me what ‘hope’ and my future looks like. May God bless you..
Hello, this is my first time participating in an online forum. I am very nervous as I have not talked about this with anyone, however I feel like I am drowning and slowly dying inside. My husband has suffered from depression all his life. When we first met, I was not aware that he had suffered from depression and the beginning of our relationship was amazing. He was this outgoing full of life person and not afraid to try anything and was very adventurous. The complete opposite of me, I tended to be more reserved and not as adventurous. He brought a lot of new feelings out in me and started showing another way of life that I had been missing out on. All this came crashing down, when further into our relationship he started going into a depressed state. I did not recognize it at the time as I was not in tune with the symptoms. To make a long story short, his depression has become quite severe and he blames me for all of it and is currently not speaking to me and has basically told me he does not want me to be in his life. He will not speak to me, answer any of my calls, emails and has pretty much locked himself away from everyone. He has left me to run everything, including a business he has owned for over 18 years and run successfully and has basically dropped the entire responsibility in my lap as well as me taking care of the entire household including all expenses and taking care of a dog that has a severe heart condition and requires a lot of care and meidcation. I have no access to any of the business accounts, so I am going in blind and I am not drawing any income from the business and am not able to seek other paying employment as I am fully immersed in trying to run this business. I am beyond overwhelmed and feel like everything is resting on me and am having a very hard time coping. I have no one to talk to and am so alone. Maybe this forum will at least help me feel human again. I am crying all the time, even as I right this note. I don’t know how I am going to manage and I worry so much about my husband who says I am a heartless, selfish, uncaring person who has caused him to be in the state he is in. He says he can not get better with me in his life. Feeling defeated tonight. Sorry. I am going through this with my “boyfriend”. He moved out & we hardly text anymore. Haven’t seen him in over two weeks. Makes me so sad & mad how it changes them & we suffer too. I hear you. I am so sorry your boyfriend left. It must be so difficult for you. Depression is so devastating to a relationship. I feel for you. I came across your website while researching and felt that I found a goldmine! The resource you’ve created is a Godsend. I’ll be dropping by often to read more insights and stories. thanks for this amazing site. I have referred many of my clients who struggle with depression here to read your posts. I know you’re no longer writing, but thank you for the incredible contribution you have made through your writing. I wonder—- what is the true definition of friend. When people say “friend”, do they really mean a casual acquaintance? There is nobody I can call and say “I’m drowning”. I once met a quote by Marilyn Monroe on the subject when a reporter remarked that she must have plenty of friends. She said, Nobody has plenty of friends, not real friends”. Michelle, I know exactly what you are going through because I am going through it myself. It hit home for me, when I read your comment about ‘friends’….. technically, I ‘have’ friends, but in reality! I only have ‘one’ friend! And since she moved 9 hours 2 years ago! I feel there is not way, I’d burden her with whining about my life on the phone, via text etc. I just pretend things are ok! So! there is really no one to open up to, swallow my pride in front of and talk honestly about what my feelings, fears etc. I am trying so hard, to find natural supplements that I can take on my own, like 5 HTP and St. John’s Wort, to see….is there something out there that can help with this awful, ugly, gigantically heavy feeling of despair!!! Hello, my name is Seth. I have been on both sides of a relationship within which depression is wreaking its havoc. I have also been a mental health professional for a number of years and have come across these feelings many times with the people whom I work. Feeling utterly alone and without true friends can sometimes be seen in terms of the ways in which we frame our relationships and the people in our lives. We often do not see that there are people in our lives who truly are just waiting for us to reach out to. This is an incredibly difficult and brave thing to do which is why resources like the words on this site can be monumental. Please know, whomever you are and wherever you may be, there IS at least one person who is willing to listen, genuinely interested in your story, and affected by the pain you are going through. My name is Seth. I have started writing about these themes and some tactics to add to your food for thought on a blog of my own. If you or anyone you know ever wat to connect with someone who has dealt with these struggles and also works in this area (as a registered clinical socail worker) you can reach out to me either through my blog or e-mail. Remember that you are not alone and that you CAN find the meaning you might be looking for. Please Take care. Can you point me to your blog or email? I’m in my fifties and going through a major depressive episode. I’ve been depressed all my life and now it seems that more and more things can make the depression worse, for example if someone is rude to me. I haven’t worked outside the home for several years. At times I’m able to go to the corner bar just for some conversation–definitely not about being depressed–the conversation (and liquor) gives me temporary relief, but It’s not a long term solution. No one to talk to on a regular basis. I feel like I’m on the verge of a complete breakdown. I have suffered the dreaded Depression since I lost my mother to suicide at age 13 She had mental health issues also. Luckily I had a sister 16 years older to look after me but she is a perfectionist and I am far from it (too creative, messy, free thinking etc) Her beliefs have had a profound effect on me over the years. I was married for 22 years but my Ex couldn’t cope with my up and down moods and left me in 2001. Don’t think he knew what emotions were!! I think a lot of people suffer these feelings but don’t realise. If someone leaves for whatever cause when you are not fully developed I do think its bound to have an impact. I am almost 57 and still suffer. I hadn’t worked for many years but recently got given a job in a residential home; but guess what?? Six weeks later; as well as moving house, working at this new job and joining the gym I’ve given myself complete and utter exhaustion and depression………So I have given in my notice! I had a week off after feeling this exhaustion………and now somehow feel deep shame and that they wouldn’t want me back; and if I am going to be ill like that; then I don’t deserve a job at all!! This is ridiculous and I know that deep down; but it’s how Depression gets to you. You can so easily feel like you are just a waste of time and space. I often wonder if we can separate physical and metal exhaustion but I think the body is a ‘whole entity’ so if one gets affected then so does the other. Nothing is reliable or consistent. I can start stories and never finish them, its frustrating. It feels like a never ending cycle at times and that’s the worst part of it for me……….. But still I have made a counselling appointment! I’m really struggling with depression. I’m 41 years old have a beautiful 8yearold son. I have been fighting depression for 4-5 years now. I reads couple of your posts that were very insightful and helpful. John I’m scared I’m not get any better. Patterns symptoms are becoming more entrenched. I’m extremely angry, having been taking anti depressants seeing a psychiatrist and a psychologist. HELP. This may sound cliche, but your writings have helped change my life. I have suffered with a similar depression to your own, all of my life. Probably like you, I have suffered enough for many lifetimes. Over the years, I have read endless self help books. None spoke to me as your words have. Thanks to you, I no longer see myself as a depressed person, but rather as a person who has episodes of depression. Thanks to you, this illness no longer controls my life and I no longer live in fear of its wrath. All along, it has been my mission to educate others about this dreadful illness, especially those who tell us to “get up and go for a walk.” Society has made some progress in bringing the reality of mental illness out of darkness, but we still have a long way to go. John, I gasped inside reading your article. My fiancé had shown signs of “dark moods” for a long time. There were dark moments/days when she was hyper critical of everything, showed little expression or joy, binge watched tv all day…. Her night drinking darkens her mood more. Outgoing one day; reclusive and shut off the next. She became fixated on me selling my house and large lovely property. She said it was non-negotiable. Every compromise insulted her. I’ve been overwhelmed and perplexed. A few weeks ago she “checked out” and hasn’t returned any of my calls which is bizarre and painful. I am worried she is depressed and feel this is a major issue. Is there anything I can do for her to let me in? Thank you. It is with deep gratitude that I say thank you for your wonderful site. 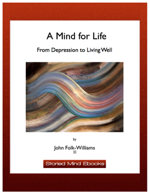 I bought your ebook “A Mind for Life” and I am staggered by the similarities between your story and mine. It is so reassuring to know that depression and anxiety can be survived, that there is hope. Thank you. Just came across your website — I am 46 years old and been experiencing depressive episodes since I was about 15. Been in hospital a few times along the way due to suicidal thoughts and one attempt. Tried several different antidepressants and bouts of therapy. Was put on lithium two years ago, which seems to stop the scarily impulsive suicidal thoughts. BUT I am still very depressed much of the time. Your site is really the only one that seems to get across what it’s really like to be depressed and what it’s really like to try and fight it. I rarely go to the standard mental health websites any more — if I see one more list entitled “Coping with Depression” and starting with the words, “take care of yourself … exercise, eat well, see friends blah blah blah” I will throw my computer out the window. I came by your website while searching for “writing as therapy for depression” in google.com. Whatever the reasons that prompt me to select your website in the list, here I am posting a comment as an introduction. I am doing this to help me examine myself, the state of my mental condition. I have not see any doctor to verify that I have any condition. Only know that such negative feelings exist within me. I am touched by several of the postings that you have shared out and I hope to make use of your website as mean for me to understand my situation. Thank you for the brief insight of your posting which has piqued my interest to get to know more of my inner self. Wonderful blog. Thank you. It is thoughtfull, gentle, and insightfull. Love the site!! Some really interesting views. I recently started my own blog about my own battle with depression and anxiety! I would love for you to take a look http://frommymindtoyourthoughts.blogspot.co.uk – it is still in early days but I have included a bit about my back story and my most recent post is my 5 tips on dealing with depression daily! Anyways, look forward to hearing from you. Hello , I would like to thank you for your great effort. I am 27 years old woman battling a mental illness. I could be struggling with depression or BPD . I have yet to be diagnosed . I have found great tips and info on your site. This is a BIG THANK YOU from Saudi Arabia. ich bin eine junge Frau aus Deutschland. Ich suchte auf deutschen Seiten nach Hilfe und Rat, die meisten Blogs sind entweder motivierend oder fachlich. Aus Zufall und Glück habe ich Ihre Seite gefunden. Und es trifft den Kern, komplett. Danke Herr Williams, dass Sie Ihre Erfahrung tauschen und Ihre Gefühlswelt während einer akuten Phase…. ich bin gerade in einer, und nichts scheint zu helfen (sub.) aber Ihre überaus menschliche Darstellung, hat mir Trost gegeben und das erste Mal seit langen, fühle ich mich verstanden und nicht allein. Thank you John for this site. Your a remarkable person to have such clarity on depression and give your knowledge to others is the best gift you can. The forum teaches others that they are not alone. Walking through a depression is one of the loneliness experiences a person and partner can ever feel. The forum reaches out to both. I also like your newsletters on depression news that are fascinating I often think in 20 yrs time they will understand what it is and they will look back on forums like this and learn how we survived the fog. Every sufferer needs a guide to the light and truth and i feel this forum really achieves that. If your lucky enough to have a good friend that has experienced a depression and guide you then your lucky but this forum reaches out to people that thought they were on their own. All the best to you. Thank you John for this site. I struggle to get through this site because of the way I feel .I am a 50 year old man ,currently unemployed and living in Maine.I was married for 20 years and have two daughters in their early 20’s.I’ve been divorced for 3 years and have never lived alone.I’ve also lost both parents in that time and have struggled with ADD and depression through out my life.I have worked at many different jobs,never settling on one career.I’m not sure what I’m even asking from you? I do see a therapist twice a week.At times I feel the need to live with others because of the intense loneliness I feel.I also fear the contact at times with others because of the loss,which makes it hard to get out and join groups.Also,there are not many around here.I live outside of Ellsworth,Me in the small town of Surry.I guess I am asking how might you approach this situation? I have very little money and would like to move but have no idea where to go? Sometimes the pain is overwhelming and very confusing.Thank god I do not drink alcohol.I’m just very confused.Thank you for any insight you might have.I feel it’s a new start for me if I can move forward in my life at all. I came across your site doing a google search and was very impressed with the support you offer to those with struggling with depression. I was wondering if I could potentially contribute by writing a guest post for your site’s blog on the process of applying for Social Security Disability with depression? I am a writer for the Social Security Disability Help Blog and thus am familiar with how difficult it can be to be approved for benefits. Please send me an email at [email protected] if you think an article would help any of your readers and I would be happy to send over a draft for your review. Thank you. This has been my depression bible as I watched depression slowly kill my partner. I have relied on it for support, understanding and guidance many times the past six months. Thankyou John…! Thankyouvery much ..
As a longtime sufferer of Depression who has persevered and has not let the illness define me, I am glad to find a place where the uplifting stories and comments have a place. God Bless you for creating this wonderful library and support system for all who are silently struggling within their circle, and really trying hard to navigate the seas of life. I, too struggle and it is such a blessing that you have created this site. May God Bless you, John!! I am new to this site. I have recently decided that I want to taper off antidepressants ( Effexor XR 75mg and Trazodone 50mg) I have been in recovery from alcohol for 22 years and reading on your blogs, I have come to see that this is the place for me! I liken it to my AA recovery, first I just wanted to stop drinking, then the pain to go away, then to find joy in my life. The medical community and numerous others have had me believe that I will always have to take pills to ward off Anxiety, Panic, Depression since the 80s!! I have a lot of health issues at 57 years old, which all tests show no cause of. GI problems, joint pain, back pain etc etc etc. I recently found a chiropractor who is teaching me about nutrition while helping to alleviate my pains. I want to find out if many of these ailments go away once I am off of these meds!! Naturally, I am n fear of all of the darkness again, but many many times they happen to some degree even while I am on these meds. The answer of upping my meds does not always work and eventually I still sink back down anyway… I want to find some peace, serenity and joy within me without these drugs!!!! It has been 30 years of being told that will never happen. I am beginning to finally disagree. I want to read more inspiring success stories and share my journey as well… Thank you all for being here!!!!! In recent weeks I have been researching male depression having felt the blow it strikes after ending a relationship with someone whom I thought was ‘the one’ for me. Your website is one of the best I’ve seen in providing useful and insightful information – thank you for all the work you do to help so many people. I’m a 52 year old woman and feel as though I have taken my lumps in life and gained a great deal of wisdom and clarity from them. Six months ago I met a 60 year old physician who I really thought was the person I belonged with. However, as the months ticked by his depression (he told me on our first date that he was a ‘glass half empty’ kind of person…red flag) started taking over our relationship and causing the usual problems. He was able to discuss it at times but was still very much stuck in the negative patterns he had been in for over 20 years (27 years of a ‘miserable’ marriage). So, since I had to step away from him, he has still been reaching out to me telling me he misses me and loves me….but on the other hand shooting frequent angry barbs at me and acting like a victim . Thus, while I have made it clear to him that I cant deal with him unless he makes his mental health his primary focus, he still hasnt done anything. He has started medication, but of course claims it doesnt help him. I’m at a loss as to what to do. I want to maintain the hope that he can heal and that we can be together again someday. But at the same time, his anger and depression are having the typical effects on me and, I am also losing hope and faith in his ability to heal. I’m seeing a therapist and doing everything to take care of myself. However I am getting the instinct that I just need to give up on him rather keep myself on the roller-coaster ride with his behavior. How does one know when she needs to give up? I”m sorry to hear about the frustration you’ve had to live with in this relationship. It sounds like you are doing all you can do. I don’t know what it is that finally convinces some people to get all the help they need, while others refuse in spite of the fact that are not happy with their lives. As to how you know when to give up – maybe if it feels instinctively like the question is “when” rather than “if,” the process is well underway? Thank you for writing about your experience here. Some couples just cant get along. If someone really loves you-it shows and you must decide what is best. Let them know what causes you heartache and that it cant be tolerated, then move on if you must. I have been to many sites on the web and have found yours to have many useful insights, thank you so much. I have suffered from depression since my early teens and have recently found out that my mother had problems with my delivery, and that I was a forceps delivery after a prolonged labour. I wondered if you had come across or knew of any studies being done relating mental health problems to birth difficulties. I’m sure nothing is so simple and we are all looking for reasons why when there probably aren’t any beyond random genetics but I do wonder at the proliferation of mental health problems in young people when babies are so big and often go beyond projected delivery dates. Not expecting anything concrete from this enquiry, but you seem like such an interesting and interested person, I thought it might be worth asking. Thanks again for providing such a useful contact point and continue to thrive through what you do, it is truly worthwhile and I hope you get some benefit from the positive vibes you propagate. No, I haven’t found anything about birth difficulties – but genetics do play a role. Having certain genes only creates a potential for a condition to develop, and more is being discovered all the time about the convergence of stress, trauma, relationships, the immune system and neurobiology in the development of depression, as well as other illnesses. My lay opinion is that it has more to do with repeated stresses and experiences rather than one-time events, but that’s only because of my history with the illness. We just don’t know and have to keep trying new ways to cope with illness – or, as some suggest, to broaden our comfort zones so that we can live with depression rather than trying so hard to get rid of it. Thanks for your kind words – my best to you. Thank you so much for giving me hope. I was at my breaking point and found peace with your works. It means alot to me to have a voice.My voice is not worthy of being heard in my relationship with my husband. I can’t even begin to explain how much it has helped to know I’m not alone. When I feel like falling apart I have a safe place to let that out. I look forward to hearing the stories of others and watching others hopefully heal as I will hopefully be healing also. Many thanks for all you do to provide resources and stories and inspiration. I wonder whether you and the network of caring people affiliated here have seen any research, stories, writing etc. about the value of taking care of others and service as a way to temper depression? There is a lot of material about the value of service to others as a major step in recovery. Viktor Frankl was probably the first to emphasize the importance of finding purpose beyond your own interests as an essential aspect of a meaningful life. David Karp has some insights about this in his book Speaking of Sadness. I believe Martin Seligman devotes a good part of his new book to this – it’s called Flourish. I’ll look around to find especially good stories and articles. This is one of those subjects that gets lip service but rarely a probing discussion. I found your site about the time you set it up, and I think you’ve done an incredible service by bringing the issue into the open. It’s amazing how many people suddenly feel they can talk about a problem they’ve kept hidden once someone takes that courageous first step of saying – I’m in your situation, and it’s OK to talk about depression. You’re not alone. The damn thing about depression is how it convinces us that whatever we do can’t be worth much – so what’s the point, why keep going, etc, etc. It’s wonderfully encouraging to hear that you’ve found this site helpful, but I hope you’ll be able to see how valuable your work is too. Sure, you can list this blog. Hi John! Came to this site through Storied Mind – what a great concept and I’ll spend some time to look around. I look forward to seeing you here. I’m still adding the basic content and will do a real launch at the beginning of June.